Posted on August 10, 2011 12:55 PM by Lana N.
Do you know any aspiring progressive rock stars? Do you know anyone who always starts new projects, organizes their friends to make something new and wonderful happen, or finds a way to shift the conversation around them into something productive? Do you see yourself this way?If you said yes to any of these questions, you'll want to take a look at a new Fellowship we're launching. Here's the description:AMERICAN DREAM FELLOWSHIP DESCRIPTIONFull time, paidLocation: anywhereIf you're an ambitious go-getter who wants to win big political fights and gets excited about 21st Century organizing, you should apply for this Fellowship. Right now.The American Dream Fellowship is a six-month, full-time, paid Fellowship run by a partnership between the New Organizing Institute, Rebuild the Dream, MoveOn.org, ColorofChange.org and other allies. You'll learn a whole new range of organizing skills, from online campaigning to field actions to political strategy. Then you'll put those skills to work as a staff member at MoveOn, Rebuild or another partner organization, fighting the good fight at the highest levels of American politics.We're looking for driven progressives from diverse backgrounds who can make fun, exciting things happen. We want social entrepreneurs -- people who make, lead, do. People who start things, like a college newspaper, or an immigrant rights walkout, or a social media community. Political or online organizing experience is nice, but not at all required.In addition to deep skills trainings, we'll give you real responsibility for important projects, as a full-time member of a team like this:- MoveOn Media, a project to win the war of ideas and beating Fox News by spreading progressive content- Rebuild the Dream, Van Jones's new meta-network that's going to beat the Tea Party at its own game- MoveOn State & Local, which wins critical fights with our new tool, SignOn.org- MoveOn Labs, our innovations laboratory- Other teams as appropriateThis will be a "virtual office" Fellowship, so you can do it from any location. Pay is very competitive. At the end of six months, if we mutually agree that you are a good fit, one of the participating organizations may offer you an ongoing position. Or we will help you find your dream job in an allied group. Either way, you will have built up your skills, and we will have built up the progressive movement -- a win-win.To apply, send your resume to Fellowship2011@moveon.org. Include a cover letter that answers these questions:1. What's a big, cool thing you've started or led? Why are you proud of it? If you've got a couple examples, great.2. Got any ideas of things you'd like to start?3. What the best thing you've ever written? Attach it, or send us a link.4. Describe your personal politics.5. Boil down why you'd be a great Fellow into one sentence.6. How techy are you? What's the most advanced thing you can do on a computer?Applications are due by August 21. Posted on August 10, 2011 10:02 AM by Lana N.
Protestors showed up in numbers at Republican Speaker of the House John Boehner's office in West Chester, Ohio to demand that the Speaker actually start focusing on jobs rather than partisan bickering in Washington. Staffers locked the door and even refused to allow protestors to send two people in to give their message directly to Boehner or his staff. When they were informed that Boehner was at a country club fundraiser, the protestors departed for the golf course soiree in nearby Dublin, Ohio. (Inside the fundraiser, donors were reportedly given golf balls with Nancy Pelosi's face printed on them.) 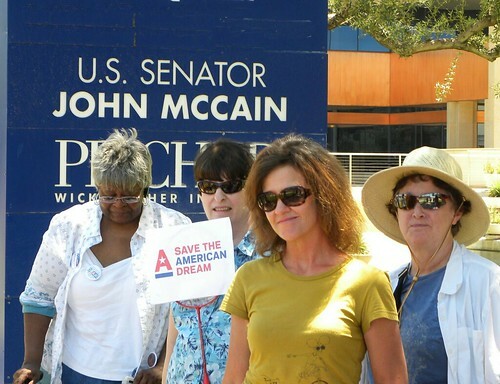 The protesters were told "Boehner chooses not to come out", and police were called to shoo the protesters away.The group was filled with people who were either out of work and directly stood in harm's way due to Boehner's policies. One woman, Sheri Dever from Dayton, held bachelor's and master's degrees in business, but can't find work because she's "overqualified." Now that she's been out of work because she has "too many qualifications", she has a second strike against her - she's unhirable because of the gap in her employment record, despite looking for work in the worst economic climate since the Great Depression. "I hope to explain to him and explain to him what it's like. [And tell him] stop the bickering, get the jobs back to Ohio not overseas, but bring them back here. We are dying out here. There is no jobs. We really need his help," Dever said. "Let's get jobs back in to the United States," she said. "I'm so sick and tired of politicians like Boehner putting their personal politics in front of our jobs and our security ... we need him to stand up for Americans not a party on either side, but to stand up for Americans." Others faulted Boehner for his stance on jobs and health care. A disabled veteran, out of work since 2008, has been sharing the insulin he gets from the federal government through VA with his wife, who lost her health insurance when her job disappeared in 2009. They are both diabetics. "I would like to see our government and Congress start concentrating on what the real problem is and that is regaining some of our jobs here," he said. "We need more jobs here or we are going to be rats in a sinking ship. People will be bailing out of these areas if they can't find jobs, can't make ends meet, and it is devastating our American way of life. "Liberals are lining up around the country to take on members of Congress for their lack of attention to jobs. We can all expect to hear lots of stories like this one in the coming month. Posted on August 10, 2011 8:54 AM by Lana N.
I see a lot of folks on Facebook and Twitter hanging their heads about what happened in the recall elections last night, when Democrats failed to pick up enough seats to take over control of the Wisconsin Senate, which would have given them the ability to block Gov. Scott Walker's austerity agenda. It's true that in that sense, last night was not a win. But this wasn't like 2004, when despite massive outrage against Bush and the Republican Party over the Iraq War, Bush was re-elected and Republicans picked up seats in both houses of Congress.The seats that were contested yesterday were lost by Democrats in 2008 (a great year for Democrats nationally and in Wisconsin) by 15%. Obama carried the state of Wisconsin that year by 2%. Outside groups like Americans for Prosperity poured tens of millions of dollars into supporting Republicans in strong Republican districts. In this context, it's amazing that any of the Democrats were even in the game, much less winners.But Democrats managed to pick up two seats last night. They upped their ground game in every district, making preparations in Republican territory for tough statewide contests. The New York Times election stats guru Nate Silver makes the point that these districts all went heavily for Walker in 2010. If they came close to splitting between Democrats and Republicans on Tuesday, he could be in trouble for a recall of his own. Guess what happened? Now the Senate is 17-16, not 19-14. It's going to be a lot harder for Walker to get anything radical through the chamber, certainly nothing like what he managed to strong-arm through in the spring. Now is not the time to hang our heads. Now it's time to get to work. Posted on August 09, 2011 1:49 PM by Lana N.
Now that the crowdsourced Contract for the American Dream is out, and Congress is out of session and back in their districts, it's time to let them know firsthand that they need to get back on the job of putting Americans back to work. We're asking you to join us all across the country at district events in your town. In three easy steps, you can join your fellow citizens to make sure that your representative hears it from the people: Focus on jobs, not cuts. 1. Click on the following link and sign up for a local event: http://civic.moveon.org/event/jobsnotcuts/2. Print out some paper copies of the Contract for the American Dream. If you can meet with any staffers from your representative, and/or if there are any media present at your event, please make sure they get a copy of the Contract. 3. Print out a sign to show your support. If you get any good pictures from your event, please e-mail us at public-support@rebuildthedream.com! Posted on August 09, 2011 4:39 AM by Lana N.
Back in early July, with no idea what sort of response we might get, we asked for your ideas to draft a Contract for the American Dream, a people-powered response to the rightwing austerity agenda. A month later, after 130,000 of you gave your feedback online and in 1,600 house meetings across the country, the end result is here: http://contract.rebuildthedream.com. [caption id="attachment_677" align="aligncenter" width="475" caption="The ten planks for the Contract for the American Dream"] [/caption]We invite everyone to sign the Contract for the American Dream and share it with friends. The website allows you to dive easily share the Contract as a whole via e-mail and social networks, or to just share a single plank. Additionally, you can discuss each individual plank with other visitors to the website just by clicking on it.We used a straightforward people-powered process to assemble the Contract. Thousands submitted ideas on our Contract website, about 25,000 ideas altogether. Those ideas were rated by visitors to the website, totalling about 6.1 million ratings. The top 40 ideas were presented and discussed at house meetings around the country, including at least one in every single congressional district, and we used the feedback from those discussions to put together the final ten ideas that constitute a jobs-creating agenda for this country.The overwhelming response from about 1,600 meetings caused us a little bit of delay in releasing the final Contract, but it certainly did not come a moment too soon. Because Congress bent to the demands of a tiny minority of Tea Party extremists, the federal government staved off the debt crisis by putting essential programs like Medicare in harm's way instead of looking to raise revenue by making the rich pay their fair share. No new ideas were brought to the forefront of the discourse, except for radical new ways to cut programs using euphemisms like "chained CPI. "So now the time has come for action. We hope that you'll show your support by signing the Contract and sharing it with your friends and family, but it's going to take more than just engaging on a website to change the direction of this country.We're taking the Contract directly to each member of Congress when they return to their district. Please click here for more information about what you can do to make sure that Congress once again turns to a jobs agenda. Posted on August 08, 2011 4:43 PM by Lana N.
Posted on August 08, 2011 9:25 AM by Lana N.
So to paraphrase Warren Buffet, whose sterling, brick and mortar, brilliantly run, cash-rich company Berkshire Hathaway was ALSO downgraded by S&P in the past, “American stocks are on sale.” Why not pick some up? I did. And I’m a 34 year old, hard working husband and father who gives a sh*t about the country he lives in and doesn’t take orders from S&P, CNN, or Congress. I give them. And so do you. Whether you think Rob's idea is foolhardy or great, he's right. We as a movement need more positive action and less pessimism and pouting. So let's hear it. What do you think of Rob's idea? What are your outside the box ideas for positive change? Posted on August 08, 2011 3:43 AM by Lana N.
Posted on August 06, 2011 8:34 PM by Lana N.
Hundreds gathered outside Congressman Jeff Denham's Fresno district office on Friday, angrily chanting "WE WANT JOBS". The Fresno metropolitan area, the fifth largest in California and the largest inland city, is currently suffering from a 16.8% unemployment rate, one of the highest in the nation. And it's only rising.Most of the people at the rally have spent more than 5 months looking for work. One man, dressed in a suit, has been unemployed for a year and a half. Said one woman from the crowd, “Unemployment doesn't pay enough, let alone leave money left over to pay the rent and eat."Rep. Denham, a Republican representing California's 19th District, defended himself by claiming that he's fighting hard to create jobs, having sponsored "nine job creation bills" cutting regulation and lowering taxes for business. He ignores that eight years of deregulation and tax cutting for corporations and the wealthy produced the worst decade for the economy since the 1930s. In the 2000s, a decade dominated by George Bush's repeated tax cuts for the wealthy and clearcutting of regulation, private employment actually fell!Denham's claim to have sponsored nine jobs bills also falls to pieces on closer inspection. He sponsored a couple of bills to clarify the definition of the watershed for a river, a bill to establish a commission that would examine ways to more easily sell federal property, a couple of ceremonial bills that have about as much economic impact in the district as renaming post offices, a bill gutting economic and environmental review over local projects, a bill to remove implementation money for the restoration of the San Joaquin River and reintroduction of salmon, and a resolution to express hope that airlines would bestow extra benefits on members of the US military.Nothing in that parcel of bills, most of which show no signs of passing any time soon, show promise for reducing the jobless rate of Fresno. Hopefully the crowds showing up at his office will cause him to look for better answers to the jobs crisis with a little more urgency. Posted on August 05, 2011 2:03 PM by Lana N.